SpaceX has become more and more successful at landing their first stage rockets, and Elon Musk says it is for reusability, which will save money in the long run and allow for quicker turn-around on launches. Sure, but, maybe there’s another reason, too. Elon Musk has become increasing vocal about his desire to get to Mars, and there is apparently going to be big announcement about his plans in September of this year at the International Astronautical Congress in Australia. This Space.com articles goes into some detail about SpaceX’s recent successes, and how they plan to return the rocket boosters to the launch pad, rather than a barge (which is mainly done for safety reasons). However, I cannot help but wonder: what about landing rockets vertically on Mars, just like in “Duck Dodgers in the 24th and Half Century!” You might think that sounds as loony as a loony tune, but it makes sense. Mars has a third of Earth’s gravity, and less in the way of cross-winds to worry about, so it would actually be easier, and if SpaceX can perfect orbit (or sub-orbit) to ground landings on Earth, they can certainly do it on Mars. I guess one day we’ll see. And I’m hoping we’ll see it sooner, rather than later! If Musk and company are planning a Mars colony, have sufficient thoughts and plans been given to the sociological/emotional wants and needs of visitors and/or residents? Will there be amusement parks, restaurants, libraries, etc., for instance? Not many people now nor in the future will be able to afford a round trip to Mars. The novelty of space travel could wear away sooner than expected. A colony for vacationing, exploring, [and maybe living] would increase the likelihood of a successful Mars venture. But still the psychological and sociological necessities of residents must be resolved. 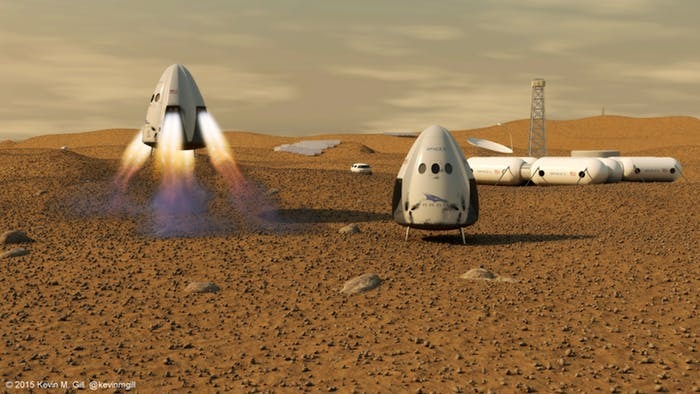 I’m pretty sure the first manned missions will be exploration mission to lay the ground work for a real colony, but a full self-sustainable Mars colony is probably a century away (or more).